Mr. K needed a friend...that much I knew. The two of us were in a new place and my work hours kept me away from him more than I would have liked. Now that we had been settled for just over three months in Atlanta, I figured it was time to search for a furever friend. 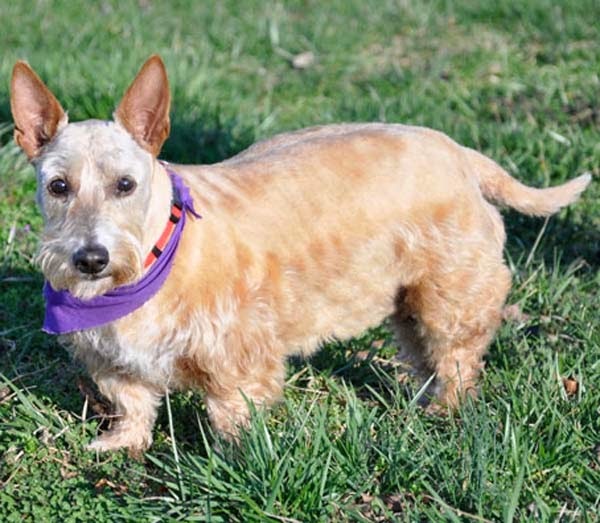 I emailed Tennessee Scottish Terrier Rescue, telling them I was interested in taking on another Scottie. I didn't have a preference for the age, gender, etc. 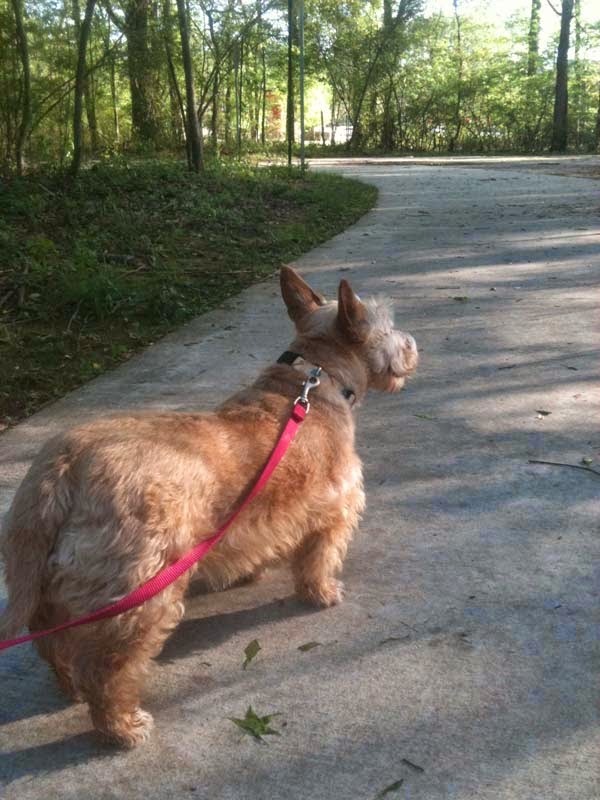 The most important thing was that he or she get along with Mr. K. About a week later, I was looking on Petfinder and I saw a beautiful picture of a wheaten Scottie (above). I had seen wheatens before but never a color like this. And then, I read the description below and decided I had to give this little girl a happy home. "Heather is a sweetie and very easily pleased. She will make herself available for back scratching at the drop of a hat. Her tail wags non-stop, her beautiful eyes show how much she loves being with a family and her sweet attitude is without a doubt a trick to win people over. She has had some type of trauma to the upper right portion of her mouth as some teeth are missing. She was apparently allowed to roam and got into someone's garbage too many times, so she was trapped in a raccoon or line trap. Heather needs a home with a traditionally fenced yard, and no small children, but she is good with both dogs and cats." I was sold then and there. It was the hardest thing to wait until the next morning to inquire about her. Unbeknownst to me, this wheaten Scottie was also part of the Tennessee Scottish Terrier Rescue. They gave me a number to call her foster Scottie family and within a week, Mr. K and I met with Heather's foster Scottie Mom and Dad so we could be introduced to his forever friend. While I can't say it was love at first sight for Heather and Mr. K (they both ignored each other and Mr. K showed more interest in the Scottie puppy Heather's foster family had brought with them), I think it goes without saying that the two are "attached to the hip" nowadays. It seems as though it was just yesterday we brought this sweet girl into our home and I can't imagine life without her now. To see what our darling Miss Heather looked like when she was rescued, visit Heather's foster Scottie Dad's blog. Can you recognize the face behind all that hair? What a difference a Scottie hair cut can make! Many thanks goes out to Heather's foster family for temporarily housing this sweet girl until I could find her (and for letting me take her from you...that couldn't have been easy!). From the moment she stepped through my apartment door, I knew she was home. We went out for some mommy-and-me time shortly after dinner. I let her pick out a new baby blue bed and some other accessories to make her feel special. Once we had them home, however, she decided she liked Mr. K's brown bed better and so, Mr. K was forced to inherit the girly one. Yes, my Scottie girl knows what she wants and I do believe she knows how to get it. Today, I'm sure she would want nothing more than for other Scotties to be given the opportunity to find a furever home like hers. So, in honor of Happy Heather Day, I humbly ask our friends to consider making a contribution of any kind to your local rescue group in Heather's honor. ArRRroO! A lovely story to remember... God bless you all !!!! The Foster family you mention are wonderful people and the result is a wonderful and happy scot. Heather is a beauty for sure, she sounds so much like my Ms. Maddie, she knows what she wants and keeps our home in order, we often refer to her as the queen. So may your Ms. Heather reign for many many years with her beauty and grace with Mr. K by her side. I think a road trip and new accessories are in order. That is such a beautiful story you made my peep cry, I am so glad Heather has you!